Great article by Fluto Shinzawa in The Boston Globe yesterday describing how the rink for the 2010 Winter Classic is going to be built at Fenway Park. Want to peek in on the progress? The NHL has set up a webcam on their web site where you can get a view from the press box of the rink being built in the shadow of the Green Monster and the Citgo Sign. Pretty neat. In another item connected to the Winter Classic, more events related to the New Year's Day game have just been announced. 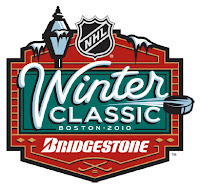 The highlight of Boston’s 2010 sporting calendar may take place just mere hours after the dawn of the new year when the Boston Bruins and Philadelphia Flyers take to the ice at Fenway Park for the NHL Winter Classic. The January 1 tilt is a throwback to the days when the city’s hockey nuts fashioned sticks from hickory trees and flooded Franklin Field and Boston Common to create outdoor ice sheets. Not surprisingly demand for tickets to the sold-out New Year’s Day tilt is off the charts, but die-hard sports fans shut out—or priced out —from the Winter Classic still have a chance to watch some hockey in the shadow of the Green Monster. On Jan. 2, Bruins greats and celebrities will skate in the Boston Bruins AT&T Legends Classic with proceeds benefiting various charities. Cam Neely, Terry O’Reilly, Johnny “Pie” McKenzie, Ken Hodge, and Rick Middleton are among the Bruins alumni who will take to the ice alongside celebrities including Denis Leary and Tim Robbins. Tickets range from $10 to $25 and are available at BostonBruins.com, Ticketmaster locations, and the TD Garden Box Office. There will be a Hockey East doubleheader at Fenway on Jan. 8 featuring a women’s game between UNH and Northeastern followed by a showdown between the men of BU and BC. Tickets are sold out, but alumni groups are holding some parties in nearby bars, such as the pre-game rally being held by BU at Tequila Rain. If you’re envious of the players skating on the Fenway infield, you have a chance to join them. While there are intentions to hold a public skate before the ice melts, the Red Sox Foundation has just announced a raffle with a chance to be one of 75 fans to join a group skate on Jan. 9. Tickets are $10 and benefit the Red Sox Foundation’s Home Base Program for injured veterans. If you're heading to Fenway for any of the games and looking for a good place to take the chill off, The Die-Hard Sports Fan's Guide to Boston has listings of dozens of places to eat and drink around Fenway. UPDATE: The NHL has just announced plans for a free fan festival on December 31 and January 1 to be located at the parking lot at Brookline Avenue and Yawkey Way. There will be air hockey and bubble hockey tables, photo opportunities, and a beverage tent. Fans can also shoot pucks through tires (it's sponsored by Bridgestone) and live goalies. Sounds like some other corporate giveaways will be there along with interview of Bruins alumni and musical performances. It's open 11 am-4pm on December 31 and 9am-1pm on January 1.